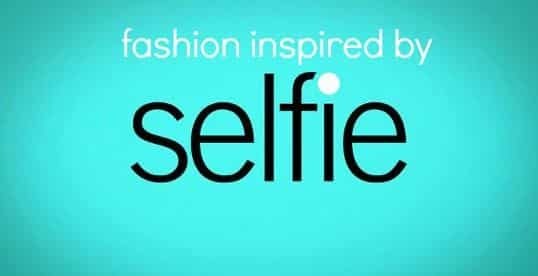 Okay, I don’t think I ever thought I’d one day be writing a fashion article about a show called “Selfie,” but then again, I never thought I’d ever actually like a show called Selfie. Despite the admittedly awful name, ABC’s new romantic comedy show is surprisingly fun! It definitely helps that I adore both of the leads: Karen Gillan, aka Amy Pond, and John Cho, aka Mr. Sulu. Instead of a Cockney flower seller, Eliza has been re-imagined as a self-centered woman obsessed with social media fame. The stern Professor Higgins is now Henry, the uptight marketing rep who is too into work to let loose. Let’s try out some outfits inspired by the cast of the show… but first, let me take a #selfie. Eliza, played by Karen Gillan, might be super-popular on Instagram, but she has no friends in real life, due to her narcissism and inability to establish meaningful connections with others. She recruits Henry to help her re-vamp her image and teach her how to make friends. Although Eliza is the number one sales representative at her job, she’s almost universally hated by her colleagues due to her selfish, preening behavior. True to her ostentatious online presence, Eliza’s wardrobe is totally in your face: low-cut tops, micro-minis, giant designer bags, blinged-out everything. (Which is totally fine for the club… not so much for work!) Nevertheless, I have to say it’s pretty fun seeing the normally hipster-y Karen Gillan dressed like a long-lost Kardashian redhead lovechild. For a more subdued take on Eliza’s flashy style, pair a jewel-toned top with a faux leather pencil skirt. Add a pair of patterned tights and some cool cutout ankle boots to get the “Amy Pond… that woman is made of legs” look. Eliza would never forget her accessories, so throw on a chain necklace and a leopard tote bag. Last but not least, make sure to snap a selfie! Henry, played by John Cho, is Eliza’s no-nonsense colleague who’s practically married to his job. He agrees to use his marketing skills to re-brand Eliza, but lays down a few ground rules, such as forcing her to put her phone down and actually say hello to the people around her. As the social education continues, however, Eliza’s fun-loving nature slowly begins to draw him out of his shell. 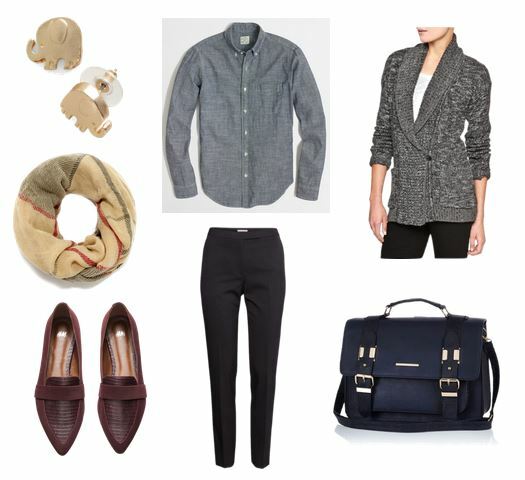 Since he’s almost always at work, Henry is usually seen in a suit, but in his off time gravitates towards preppy classics like chambray shirts, cardigans, and bow ties. Get his polished off-duty look with a relaxed men’s shirt (or a boy’s shirt, depending on your body type), a shawl collar cardigan, and well-cut slacks. A pair of snappy loafers and a plaid scarf complete the ensemble, while a pair of elephant earrings allude to Henry’s first branding success story. Bryn, played by Allyn Rachel, is Eliza’s Etsy-loving, hipster neighbor. (I’m betting she wears a lot of ModCloth and Anthropologie!) Although the two women are polar opposites, Eliza sets out to befriend Bryn on her new quest to forge real relationships. However, Eliza’s superficial attempt to fit in at Bryn’s book club are pretty disastrous. Bryn and her oh-so-quirky friends are clearly meant to poke some gentle fun at the Manic Pixie Dream Girl stereotype, but that doesn’t mean their style isn’t seriously fun. 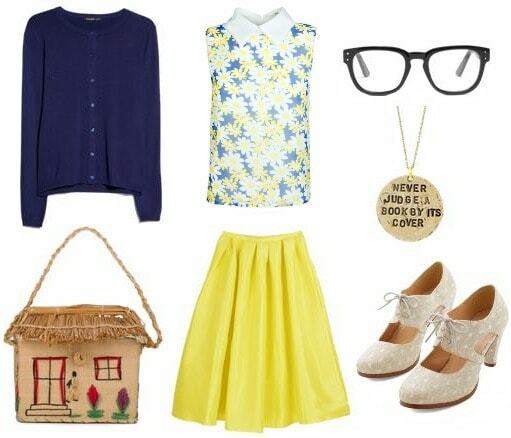 Snag their retro-inspired looks for yourself with a daisy-print blouse, a bright midi skirt, and a demure cardigan. Add a pair of spectacles (these are fittingly called “bookclub glasses”) and a delightfully eccentric straw purse… now all you need is a copy of The Curious Incident of the Dog In the Night-Time! Would you wear these outfits? Do you watch Selfie? What other inspirations would you like to see featured here on College Fashion? Let us know in the comments!